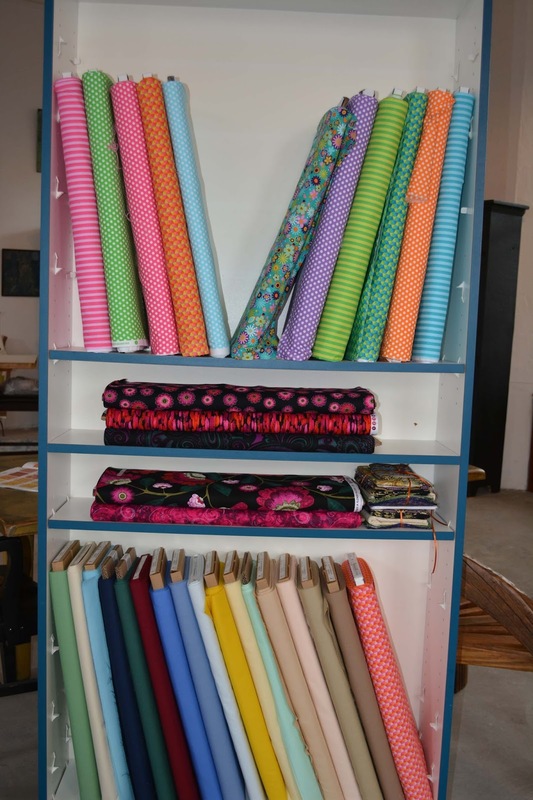 A New Quilt Shop Opens! 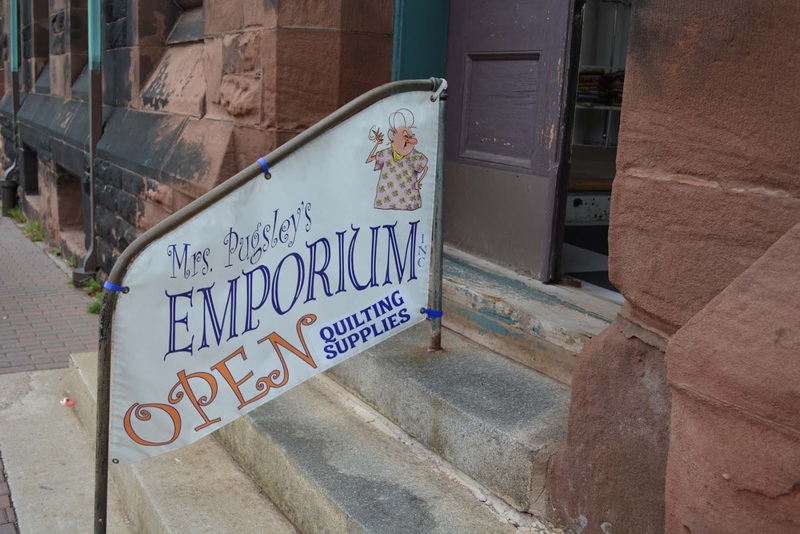 Mrs. Pugsley's Emporium is housed in an historically significant building and is a landmark in downtown Amherst. It is an absolutely amazing spot to house a quilt shop. 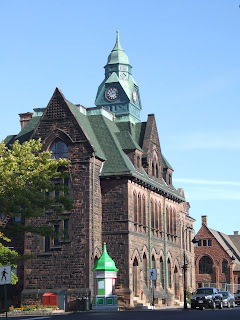 Beth herself has been a big part of Amherst's history, in her previous life as owner/pharmacist of a drugstore originally owned and operated by Sir Charles Tupper, a former Prime Minister of Canada. She honours the clock tower building by creating in her store a unique ambiance of past and present, combining artifacts of Amherst's history along with a computer work station where how-to-quilt videos may be viewed and downloaded. It is an interesting spot to say the least, put together with a great deal of vision for continued growth. 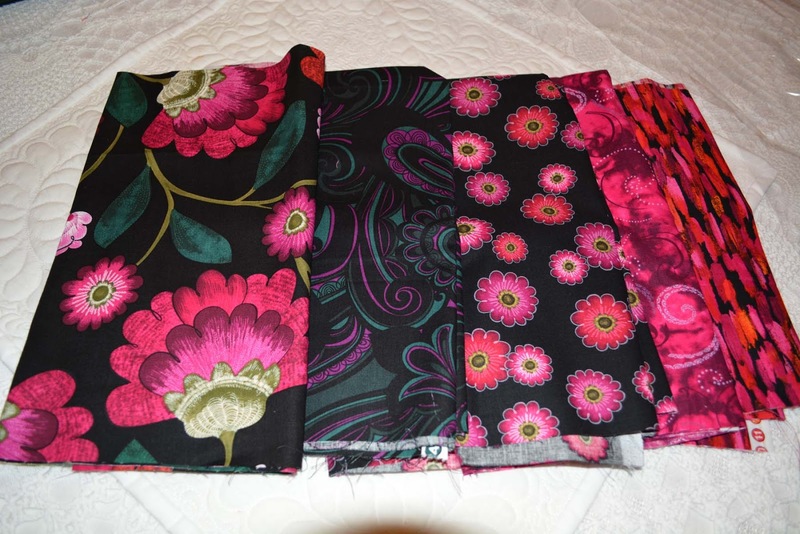 I left the shop with some "Flabbies" of a new line by Benartex called Floral Philosophy by Kanvas. It will be awhile before I get to stitch these as I am still knee deep in book projects but I wanted to get them before they got snapped up. Another customer was purchasing some of the gorgeous "Florentine" collection by Hoffman, which I have just finished using. I know she will love these fabrics - my project just glows! 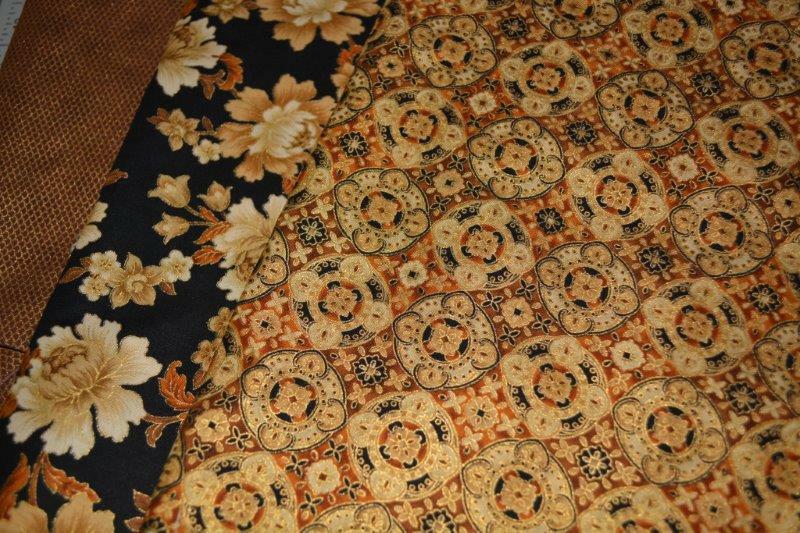 It's exciting to be able to walk down the street and have all these beautiful fabrics available...something our local area has not had for a long time. I encourage everyone to check out and support Mrs. Pugsley's Emporium (tell her Karen sent you :) For now, open hours at the shop are minimal so check out Mrs. P's blog first to make sure she is open when you arrive. I haven't mentioned the bees much this summer because they aren't doing anything worthy of mention. 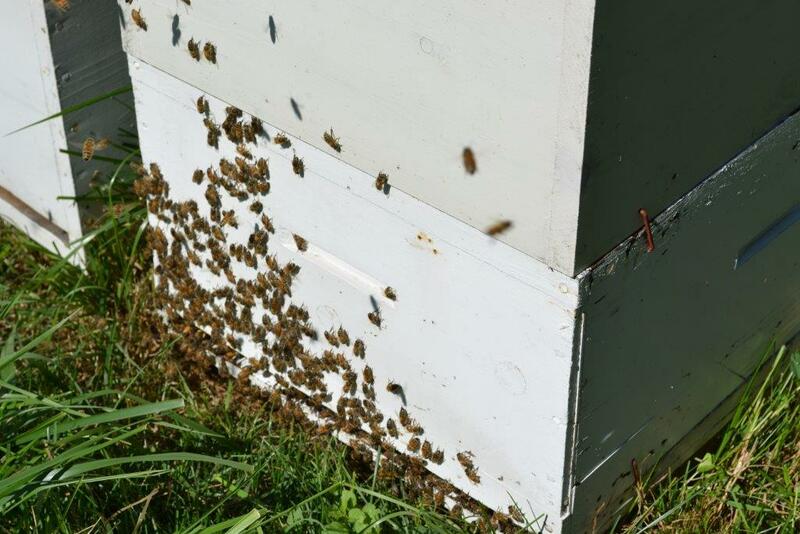 They appear happy and healthy but are not making very much honey at all. They are way behind in production for this time of year. Originally, we suspected our early wet summer had something to do with this, but lately we've had lots of sunshine. They appear to be lazing away, taking the time to smell the roses...or in this case, the goldenrod. We are a big perplexed as to their inaction. Old-timers would tell us it means a mild winter ahead and they don't feel the need to store away as much as they normally do. It's rather hard to reprimand them or threaten to withhold pay; we just have to let Mother Nature take its course and see what the outcome will be in the fall. Or in this case, 16 of each. 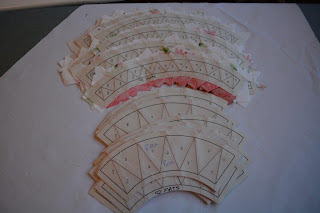 Yesterday I sewed these 32 foundation sections for the project I am working on (the top ones are not trimmed as yet). This is not normally the way I work, preferring to sew a single block at a time. Logically, doing them the Henry Ford method (i.e. assembly line) made perfect sense as I was less likely to mix up colours. Additionally, I did not have to change to a sharper needle when adding the template sections of the block, and then back again when doing the next foundation. Surely this saved me some time. The day dragged however, and I missed being able to look over and see my pretty finished blocks, encouraging me to make more. 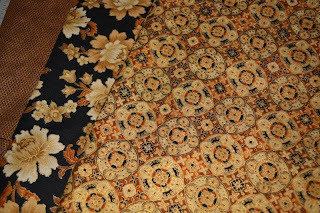 It does put me in a good place to start today as I expect to have the 32 blocks finished well before noon but it was a stretch to sew these yesterday. Which way do you work? Granted, I am not at the end of my book projects but I am making great progress on the manuscript and it seemed more sensible to have this now rather than when I finished. Did I need a new camera? Nope. This was all about "want", and I've been wanting this one for awhile. It is red, after all. Maddie was a bit too distracted by the wind to hold still very long. He lived up to his rapper name given him by our eldest son - Mad.E. - as he chased all over the place after every leaf that moved. Quilting has been a very rewarding experience for me this month. I can't show you what I am sewing...but I can show you what I am growing. 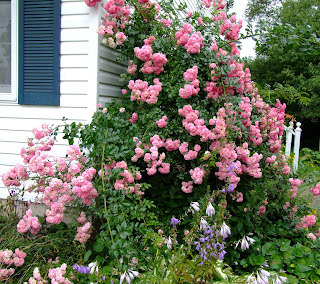 Friend and quilt appraiser Diane Shink dropped by last week and sent this picture which she took of our rosebush. She suggested I share it here on the blog. You can read more about this rose on Wikipedia. It's a beauty for sure. Carol asked about my reference to Blueberry Grunt yesterday. Grunt is an old Maritime favourite, and absolutely delicious. 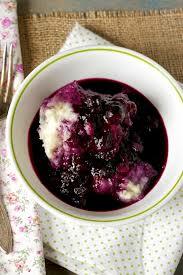 Basically, it's dumplings cooked in blueberry sauce. There's all kinds of recipes around, this one from the Taste of Nova Scotia cookbook is a good example. In my house, there would be no cinnamon added - only nutmeg. As in making other dumplings, it's key not to remove the lid while the dumplings are steaming, otherwise they come out doughy. 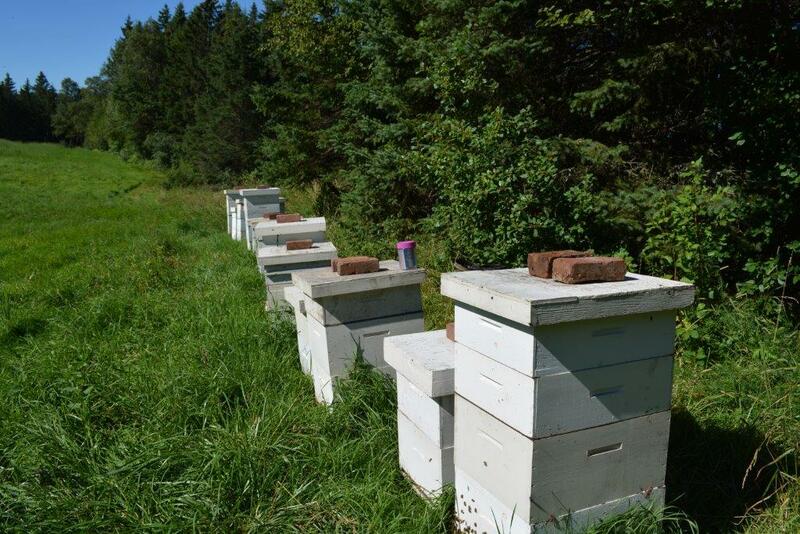 The folks who rent the bees for pollination asked if we would like to come pick some blueberries in one of their fields. Would we? Oh yes! I love to pick berries. Hubby came to help and we filled two large bowls in about a half hour. These are not the large, highbush berries: these are the native wild blueberries full of antioxidants, for which Cumberland County is famous. And are they tasty! Since hubby helped pick, he will be rewarded with a pie...and maybe some blueberry grunt. The sons will have theirs in smoothies but my favourite way is simply in a bowl with a little milk. Umm, umm. A very tight work deadline has left little time for blogging, but hubby and I took a break this long weekend for a visit to Five Islands. It's always a wonderful boost to go home. These are two of the islands, Diamond and Long, taken from the Blue Sac Road. This is the end of Moose Island, and Diamond Island. There was lots of activity on the lighthouse grounds, and even some in the air. This fellow hang gliding was having a great time catching the currents; he floated out over the cliffs and the bay, and circled around the lighthouse. Every so often it would look like he was about to land, and then he took off skyward again. He was still going strong when we left. We climbed to the top of the lighthouse to shoot some pictures. From left to right are Moose, Diamond, Long, Egg and Pinnacle Islands. To the right of Pinnacle is Pinnacle Rock. We visited the provincial park on Bentley's Mountain and walked along the shore past these cliffs. The tide was on its way out and the mud flats were wet and soft. 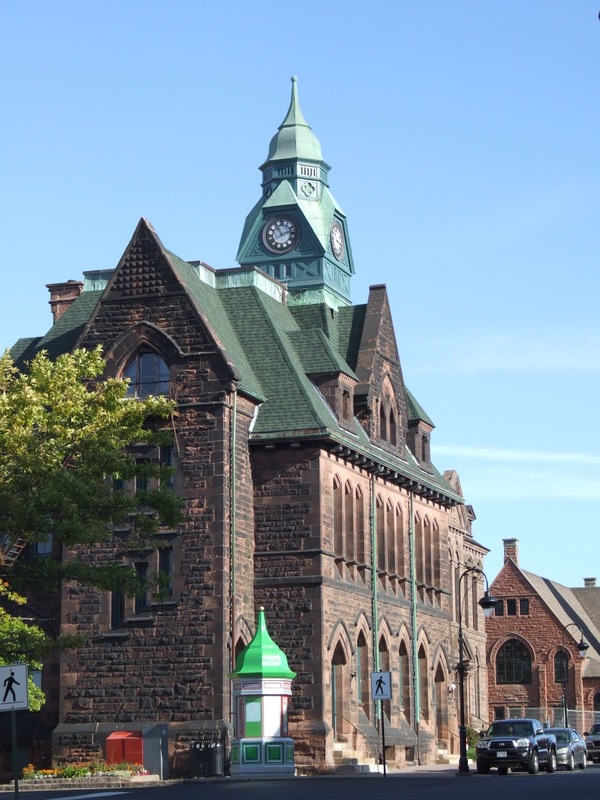 The Minas Basin where Five Islands is situated boasts the world's highest tides. This is The Old Wife - can you see her lying on her back with her hands folded at the end of the mountain? The piece in the water is her hat. Looking out from the Old Wife; this is Moose and part of Diamond and Long. The water is still deep here now, but when the tide is out you can walk to Moose Island. Naturally, the day included lobster rolls and fried clams from Diane's. We also met up with some old friends which made it more special. 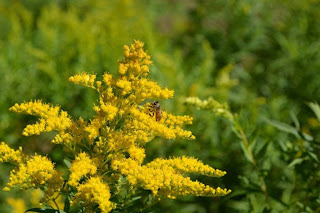 Cousin Barbara, if you are reading this from Ontario I hope you have enjoyed the pictures!